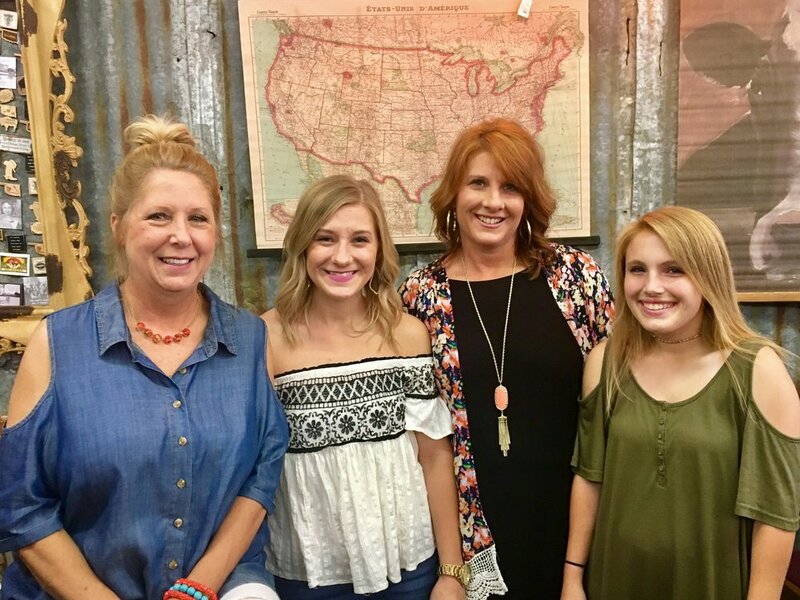 LORA FRAZIER: AFTER WORKING 20+ YEARS IN THE CORPORATE WORLD AND RAISING 2 CHILDREN, I DECIDED TO PURSUE MY PASSION OF OWNING MY OWN BUSINESS. I WANT TO OFFER MY CUSTOMERS NOT ONLY AMAZING PRODUCTS WITH A RANGE OF VARIETY BUT AT A REASONABLE PRICE. CUSTOMER SERVICE AND BUILDING FRIENDSHIPS IS MY NUMBER ONE PRIORITY. IT ALL STARTED WHEN I TOOK A YEAR OFF OF WORK TO DO SOMETHING THAT I LOVED TO DO. I STARTED REFURBISHING FURNITURE FROM MY GARAGE WHICH TURNED INTO MY HUSBAND AND KIDS GETTING INVOLVED. THIS TURNED INTO A FAMILY BUSINESS OF REFURBISHING AND BUILDING CUSTOM FURNITURE. THEN THE OPPORTUNITY CAME FOR ME TO OPEN THE STORE AND I WAS ABLE TO COMBINE MY PASSION FOR FASHION AND HOME DECOR INTO THE MIX. I AM VERY LUCKY TO HAVE A SUPPORTIVE FAMILY, THE PERFECT BUSINESS PARTNER AND LOYAL CUSTOMERS THAT HELP ME MAKE THE STORE THE BEST IT CAN BE. DEB MELTON: I HAVE BEEN A BUSINESS OWNER FOR MANY YEARS. I FIRST MEET LORA WHEN SHE WAS A VENDOR IN MY RETAIL STORE SELLING HER REFURBISHED AND CUSTOM FURNITURE. WE BECAME FAST FRIENDS. AFTER MANY YEARS OF OPERATING MY OWN STORE I NEEDED A BREAK. WHEN LORA STARTED HER BUSINESS SHE WAS GRACIOUS ENOUGH TO WELCOME ME IN AS HER PARTNER. OUR PERSONALITIES AND STYLE ARE THE PERFECT MIX ALLOWING US TO MAKE 405 MERCANTILE A TRULY AMAZING STORE FOR EVERYONE.